We have seen in a previous post what are the common misconceptions in big data analytics, and how relevant it is starting looking at data with a goal in mind. Even if I personally believe that posing the right question is 50% of what a good data scientist should do, there are alternative approaches that can be implemented. The main one that is often suggested, in particular from non-technical professionals, is the “let the data speak” approach: a sort of magic random data discovery that should spot valuable insights that a human analyst does not notice. Well, the reality is that this a highly inefficient method: (random) data mining it is resource consuming and potentially value-destructive. The main reasons why data mining is often ineffective is that it is undertaken without any rationale, and this leads to common mistakes such as false positives; overfitting; neglected spurious relations; sampling biases; causation-correlation reversal; wrong variables inclusion; or eventually model selection (Doornik and Hendry, 2015; Harford, 2014). We should especially pay specific attention to the causation-correlation problem, since observational data only take into account the second aspect. However, according to Varian (2013) the problem can be easily solved through experimentations. Hence, I think that a hybrid approach is necessary. An intelligent data discovery process and exploratory analysis are valuable at the beginning to correctly frame the questions (“we don’t know what we don’t know” - Carter, 2011). Then, the question has to be addressed from several perspectives and using different methods, which sometimes may even bring some unexpected conclusion. More formally, and in a similar fashion to Doornik and Hendry (2015), I think there are few relevant steps for analyzing the relationships in huge datasets. The problem formulation, obtained leveraging theoretical and practical considerations, tries to spot what relationships deserves to be deepened further. The identification step instead tries to include all the relevant variables and the effects to be accounted for, through both the (strictest) statistical methods as well as non-quantitative criteria, and verifies the quality and validity of available data. In the analytical step, all the possible models have to be dynamically and consistently tested with unbiased procedures, and the insights reached through the data interpretation have to be fed backward to improve (and maybe redesign) the problem formulation (Hendry and Doornik, 2014). Those aspects can be incorporated into a lean approach, in order to reduce the time, effort, and costs associated to data collection, analysis, technological improvements, and ex-post measuring. The relevance of the framework lies in avoiding the extreme opposite situations, namely collecting all or no data at all. The next figure illustrates key steps towards this lean approach to big data: first of all, business processes have to be identified, as well as the analytical framework that should be used. 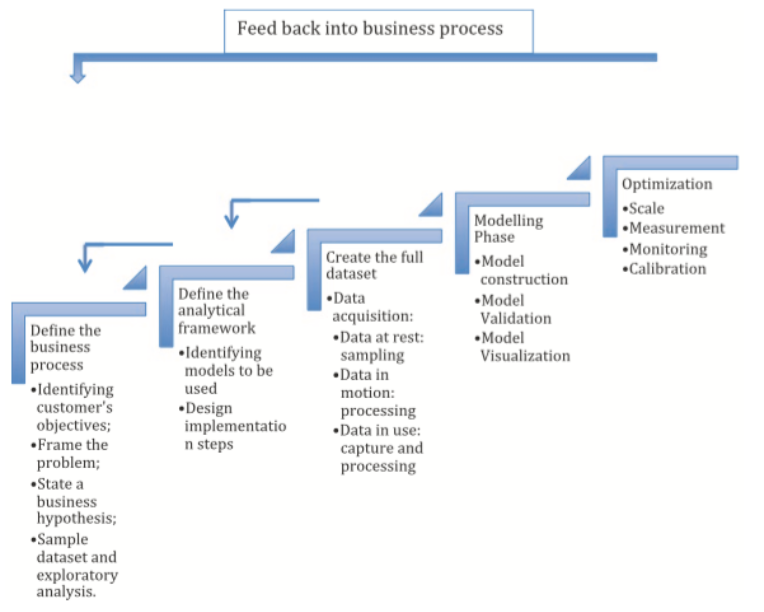 These two consecutive stages (business process definition and analytical framework identification) have a feedback loop, and the same is also true for the analytical framework identification and the dataset construction. This phase has to consider all the types of data, namely data at rest (static and inactively stored in a database); at motion (inconstantly stored in temporary memory); and in use (constantly updated and store in database). The modeling step embeds the validation as well, while the process ends with the scalability implementation and the measurement. A feedback mechanism should prevent an internal stasis, feeding the business process with the outcomes of the analysis instead of improving continuously the model without any business response. This approach is important because it highlights a basic aspect of big data innovation. Even if big data analytics is implemented with the idea of reducing world complexity, it actually provides multiple solutions to the same problem, and some of these solutions force us to rethink the question we posed in a first place. All these considerations are valid both for personal project and companies’ data management. Working in a corporate context requires also further precautions, such as the creation of a solid internal data analytics procedure. Data need to be consistently aggregated from different sources of information, and integrated with other systems and platforms; common reporting standards should be created - the so-called master copy - and any information should be validated to assess accuracy and completeness. Having a solid internal data management, together with a well-designed golden record, helps to solve the huge issue of stratified entrance: dysfunctional datasets resulting from different people augmenting the dataset at different moments or across different layers. As shown so far there are a series of issues related to internal data management policies and approaches. The answers to these problems are not trivial, and we need a frame to approach them. A Data Stage of Development Structure (DS2) is a maturity model built for this purpose, a roadmap developed to implement a revenue-generating and impactful data strategy. It can be used to assess the current situation of the company and to understand the future steps to undertake to enhance internal big data capabilities. The following table provides a four by four matrix where the increasing stages of evolution are indicated as Primitive, Bespoke, Factory, and Scientific, while the metrics they are considered through are Culture, Data, Technology, and Talent. The final considerations are drawn in the last row, the one that concerns the financial impact on the business of a well-set data strategy. Stage one is about raising awareness: the realization that data science could be relevant to the company business. In this phase, there is neither any governance structure in place nor any pre-existing technology and above all no organization-wide buy-in. Yet, tangible projects are still the result of individual’s data enthusiasm being channelled into something actionable. The set of skills owned is still rudimental, and the actual use of data is quite rough. Data are used only to convey basic information to the management, so it does not really have any impact on the business. Being at this stage does not mean being inevitably unsuccessful, but it simply shows that the projects performance and output are highly variable, contingent, and not sustainable. The second Phase is the reinforcing one: it is actually an exploration period. 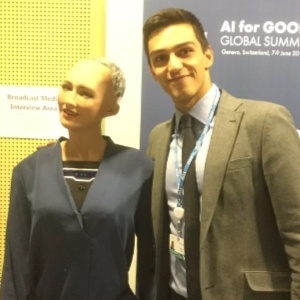 The pilot has proved big data to have a value, but new competencies, technologies and infrastructures are required — and especially a new data governance, in order to also take track of possible data contagion and different actors who enter the data analytics process at different stages. Since management contribution is still very limited, the potential applications are relegated to a single department or a specific function. The methods used although more advanced than in Phase I are still highly customized and not replicable. By contrast, Phase III adopts a more standardized, optimized, and replicable process: access to the data is much broader, the tools are at the forefront, and a proper recruitment process has been set to gather talents and resources. The projects benefit from regular budget allocation, thanks to the highlevel commitment of the leadership team. Step four deals with the business transformation: every function is now data-driven, it is lead by agile methodologies (i.e., deliver value incrementally instead of at the end of the production cycle), and the full support from executives is translated into a series of relevant actions. These may encompass the creation of a Centre of Excellence (i.e., a facility made by top-tier scientists, with the goal of leveraging and fostering research, training and technology development in the field), high budget and levels of freedom in choosing the scope, or optimized cutting-edge technological and architectural infrastructures, and all these bring a real impact on the revenues’ flow. A particular attention has to be especially put on data lakes, repositories that store data in native formats: they are low costs storage alternatives, which supports manifold languages. Highly scalable and centralized stored, they allow the company to switch without extra costs between different platforms, as well as guarantee a lower data loss likelihood. Nevertheless, they require a metadata management that contextualizes the data, and strict policies have to be established in order to safeguard data quality, analysis, and security. Data have to be correctly stored, studied through the most suitable means, and to be breach-proof. An information life cycle has to be established and followed, and it has to take particular care of timely efficient archiving, data retention, and testing data for the production environment. A final consideration has to be made about the cross-stage dimension of “Culture”. Each stage has associated a different kind of analytics, as explained in Davenport (2015). Descriptive analytics concerned what happened, predictive analytics is about future scenarios (sometimes augmented by diagnostic analytics, which investigates also the causes of a certain phenomenon), prescriptive analytics. suggests recommendations, and finally, automated analytics are the ones that take action automatically based on the analysis’ results. Some of the outcomes presented so far are summarized in the following figure. The next chart shows indeed the relation between management support for the analytics function and the complexity and skills required to excel into data-driven businesses. The horizontal axis shows the level of commitment of the management (high vs. low), while the vertical axis takes into account the feasibility of the project undertaken — where feasibility is here intended as the ratio of the project complexity and the capabilities needed to complete it. 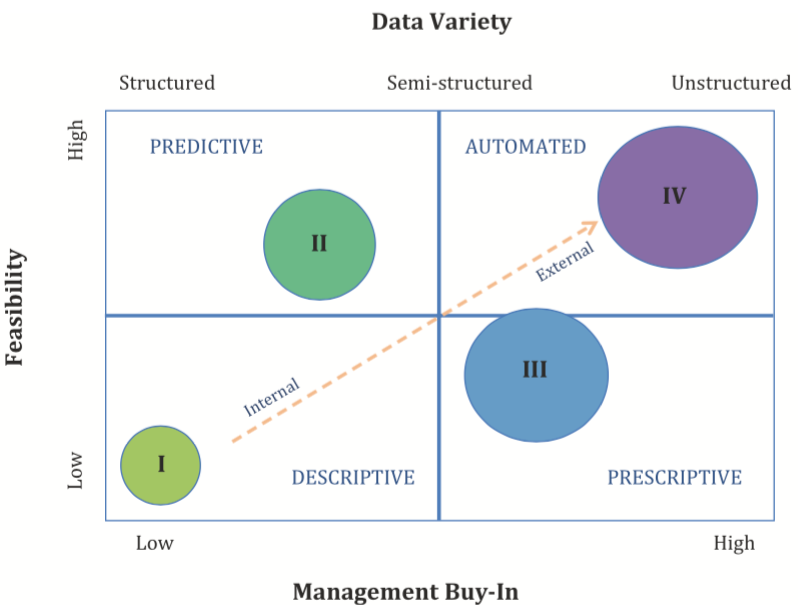 The intersection between feasibility of big data analytics and management involvement divides the matrix into four quarters, corresponding to the four types of analytics. Each circle identifies one of the four stages (numbered in sequence, from I-Primitive to IV-Scientific). The size of each circle indicates its impact on the business (i.e., the larger the circle, the higher the ROI). Finally, the second horizontal axis keeps track of the increasing data variety used in the different stages, meaning structured, semi-structured, or unstructured data (i.e., IoT, sensors, etc.). The orange diagonal represents what kind of data are used: from closed systems of internal private networks in the bottom left quadrant, to market/public and external data in the top right corner. Once the different possibilities and measurements have been identified, it would be also useful to see how a company could transition from one level to the next. In the following figure, some recommended procedures have been indicated to foster this transition. In order to smoothly move from the Primitive stage to the Bespoke, it is necessary to proceed by experiments run from single individuals, who aim to create proof of concepts or pilots to answer a single small question using internal data. If these questions have a good/high-value impact on the business, they could be acknowledged faster. Try to keep the monetary costs as low as possible (using the cloud, open source software, etc. ), since the project will be already expensive in terms of time and manual effort. On a company level, the problem of data duplication should be addressed. The transition from Bespoke to Factory instead demands the creation of standard procedures and golden records, and a robust project management support. The technologies, tools, and architecture have to be tested, and thought as they are implemented or developed to stay. The vision should be medium/long-term then. It is essential to foster the engagement of the higher senior management level. At a higher level, new sources and type of data have to be promoted, data gaps have to be addressed, and a strategy for platforms resiliency should be developed. In particular, it has to be drawn down the acceptable data loss (Recovery Point Objective), and the expected recovered time for disrupted units (Recovery Time Objective). Finally, to become data experts and leaders and shifting to the Scientific level, it is indispensable to focus on details, to optimize models and datasets, improve the data discovery process, increase the data quality and transfer- ability, and identify a blue ocean strategy to pursue. Data security and privacy are essential, and additional transparency on the data approach should be provided to the shareholders. A Centre of Excellence (CoE) and a talent recruitment value chain play a crucial role as well, with the final goal to put the data science team in charge of driving the business. The CoE is indeed fundamental in order to mitigate the short-term performance goals that managers have, but it has to be reintegrated at some point for the sake of the organization scalability. It would be possible now to start documenting and keeping track of improvements and ROI. From the final step on, a process of continuous learning and forefront experimentations is required to maintain a leadership and attain respectability in the data community. I have included also a suggested timeline for each step, respectively up to six months for assessing the current situation, doing some research and starting a pilot; up to one year for exploiting a specific project to understand the skills gap, justify a higher budget allocations, and plan the team expansion; two to four years to verify the complete support from every function and level within the firm, and finally at least five years to achieving a fully operationally data-driven business. Of course, the time needed by each company varies due to several factors, so it should be highly customizable. Carter, P. (2011). “Big data analytics: Future architectures, Skills and roadmaps for the CIO”. IDC White Paper. 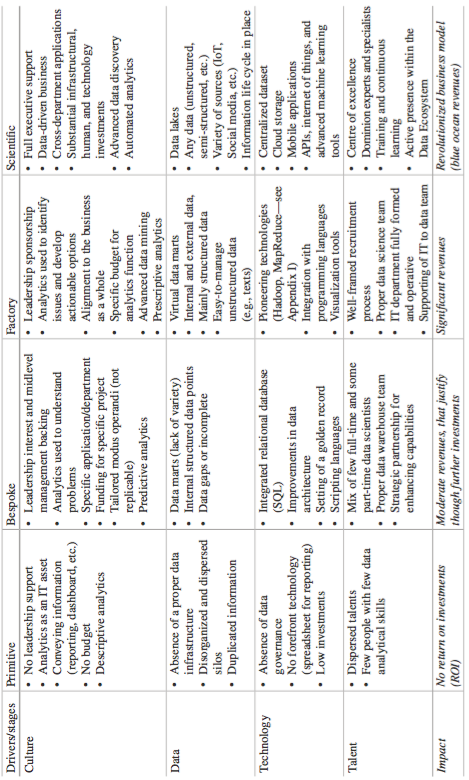 Retrieved from http://www.sas.com/resources/asset/BigDataAnalytics-FutureArchitectures-Skills- RoadmapsfortheCIO.pdf. Davenport, T. H. (2015). “The rise of automated analytics”. The Wall Street Journal, January 14, 2015. Retrieved October 30, 2015 from http://www.tomdavenport.com/wp-content/uploads/The-Rise-of- Automated-Analytics.pdf. Doornik, J. A., & Hendry, D. F. (2015). “Statistical model selection with big data”. Cogent Economics & Finance, 3, 1045216. Harford, T. (2014). “Big data: Are we making a big mistake?” Financial Times. Retrieved from http://www.ft.com/cms/s/2/21a6e7d8-b479-11e3-a09a-00144feabdc0.html#ixzz2xcdlP1zZ. Hendry, D. F., & Doornik, J. A. (2014). Empirical model discovery and theory evaluation. Cambridge,Mass. : MIT Press. Varian, H. (2013). “Beyond big data”. NABE annual meeting. San Francisco, CA, September 10th, 2013. Note: the above is an adapted excerpt from the forthcoming book “Big Data Analytics: A Management Perspective” (Springer, 2016). The following questionnaire provided could help managers to grasp a rough idea of the current data stage of maturity they are facing within their organizations. It has to be integrated with deep conversations and meetings with the big data analytics (BDA) staff, the IT team, and supported by solid researches. What is your investment level in BDA capabilities? What the executives’ support to analytics capabilities? What is your current stage of working with data? Collaborative - people are willing to work together and share. Creative - innovation is valued and we are encouraged and monetarily compensated for our original shared contributions. We have a BDA and security policies, and we anonymized all the relevant data to protect our clients and partners’ privacy. We have an efficient process for data aggregation, integration, normalization and analysis, and we can manage easily any amount of inflowing data. Once each single question has been answered, it is simple to obtain a rough measure of the data maturity stage for a certain company. For each answer indeed, it has to be considered the number associated to that answer, and then it is enough to sum up all the numbers obtained in this way. So, for example, if in the third question the answer is “we take action using analytics”, the number to be considered is 3, since it is the third answer of the list.